Hell Folks, Just purchased a 1952 cub with a belly mower, push blade and tire chains for $800 delivered to my door. It runs great, drives, shifts and even stops! The only problem I see are fuel leaks. She is leaking out the bowl and out the carb. If you forget and leave the fuel on it will flood the engine. Is there a carb kit and a seal sit for the sediment bowl? Also dumb question where is the oil dipstick? Cant seam to find it. Thanks in advance. Dip stick is attached (or should be) to the cap just below and to the right of the carb. Welcome to the forum, and congratulations on making a great purchase, that was about half the normal price for a cub and those attachments. If you go to the Quick Links in the upper left corner of the page you can download manuals, including owner's manual. A good place to get new Parts is TM Tractor, one of the sponsors at the bottom of the page. The dipstick is the round dome just below the carb., and sometimes takes a pretty good pull to remove it. Be careful of your knuckles banging on the carb. Congrats on the Cub. They have heart and character. The fuel bowl originally had a cork gasket. Possibly yours is dried out. I've made my own and it's worked well. As far as the carb, it is most likely the float not working properly. I would do a good cleaning before spending money on a rebuild when it might not be needed. If you do pull the carb, be careful taking it apart. Don't twist it, you'll break off the small tube inside. As a side note l've also made my own carb to manifold gaskets using regular gasket paper. You won't be able to download any of the manuals until you've logged a 2nd post. Once you do that, you'll have access to all the manuals on the server. It's located under the "Quick Links" pull-down menu in the upper left of the screen. Go to "PDF Manuals", then scroll down and select whatever manual interests you. As a new owner of a Cub, we'd suggest downloading the Owner's Manual first and taking some time to read it. Many questions you may have will be answered there. Then, as far as working on your Cub, there are Service Manuals and other information that will be helpful. Use the "Search" box in the upper right of the screen. It will locate answers to many of your questions. Glad to have you here. Get that 2nd post under your belt and try to attach a picture of your Cub. We'd like to see it. Below is a page from the 1955 Cub owner's manual, showing the engine oil dipstick. Below is the whole 1955 Cub owner's manual, the experts on here recommend that people read it, it has lots of info about operation, maintenance, and lubrication. There is a table of contents on page 1. They have said on here that IH did not make a new owner's manual every year, this manual is close to the year Cub you have, and has the same electrical system that a 1952 Cub originally had. It was the closest year in the group of manuals I looked at. cub is sitting. Or, the float level can be too high, or the needle and seat can have dirt in it, even a small piece of dirt will keep if from sealing. The float level needs checking and setting exactly when the carb is apart. Below is a new needle and seat at TM Tractor, they are all metal. It is a Case IH part, it says. The Cub looks good in your pics. I would check all the oils before using the Cub. If they are low on oil, it can damage the parts. There are 3 separate gear case oils at the rear of a Cub, with 3 separate oil levels to check, the transmission, and 2 final drives. The trans commonly get water in them from rain, or condensation inside the case. There is an oil level plug low on the left side, the trans is filled to there. The drain plug can be seen from under the platform, with a mower under the Cub, it might be hard to get at. The trans filler plug is to the rear of the gear shift lever. To check the left final drive oil, you will need to remove the mower drive parts, if they are attached to the drawbar brackets, and the drawbar, the oil level plug is behind the drawbar bracket. The right final drive oil plug is ahead, probably behind mower bracket parts, if the mower attaches there. The final drives are the same gear case, facing opposite ways on the right and left sides. To change their oils, you need to remove the final drive oil pans, at the bottom of the units. There are gaskets that probably need replacing if you remove the pans. TM Tractor below on the page has new gaskets, and Cub parts. The fan assembly needs oil put in it, if low, it can ruin it. The manual shows how to put oil in it. The clutch throwout bearing has a grease fitting that needs greasing. 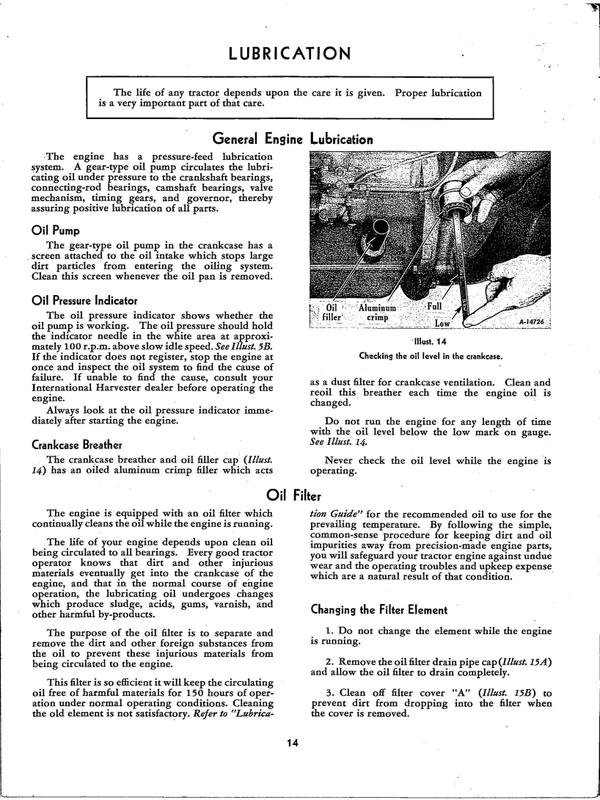 Below is a page from the owner's manual I posted above, showing the lubrication guide. There are 2 pages missing from the 1955 owner's manual in the lubrication section. 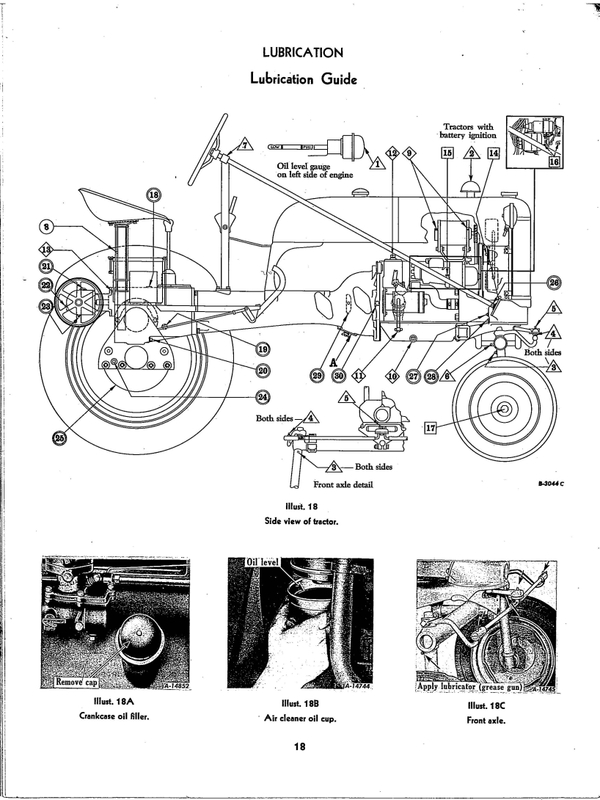 Below is the 1950 Cub owner's manual, you can use the lubrication section in it, it is complete. 1950 had a different electrical system than 1952, so don't use that info in the manual. Last edited by Glen on Mon Mar 26, 2018 10:44 pm, edited 1 time in total. Looks like a pretty good rig. I bleieve that is the first one I ever saw that used the right angle belt attachment to drive the mower. That 90 degree belt deal does have it's own oil supply, so don't forget it when checking everything. Wish l could be in the right place at the right time like that. Good luck with it, sounds like it's already a runner so it should be fairly easy to do any tweaks that it might need.